Our Crew is Replaceable, Your Package Isn’t. Yes, yes… this is a digital build, but rules are made to be bent. Plus we really like Futurama! It helps that this replica of the Planet Express ship, digital though it may be, is an utterly perfect mini-figure recreation of the famous cartoon vessel, right down to the complete interior. Nicola Stocchi is the designer behind it and you take a trip to the world of tomorrow by clicking here. Entries for TLCB Summer Building Competition keep on rolling in! Here are two more of our favourites that arrived this week. First up (above) is Sam the First (aka Sir. Manperson)’s digital ‘Prowler’. We don’t often feature digital creations here, and Sam immediately put himself at a disadvantage in the competition by choosing to build in virtual reality. But Sam must really want the awesome prizes up for grabs and has gone all out to tick as many boxes on the Elves’ wishlist as possible. Bright colour? Check. Racing stripes? Check. Violence potential? Big check. He’s even added a pair of Elves to the build to score himself some bonus points. You can see more of Sam’s entry on Flickr at the link above. 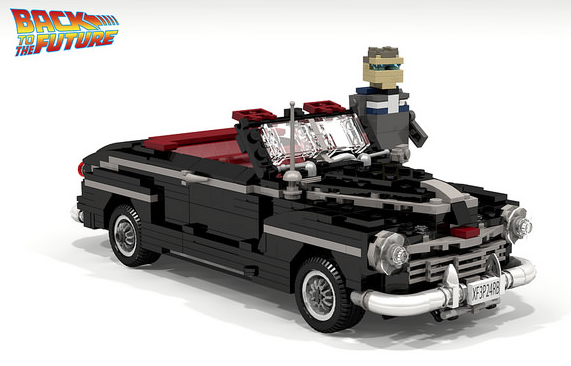 The second creation in today’s post comes from fellow Flickr builder and previous bloggee Calvin Sun. Calvin’s ‘Elves of Hazard’ model also ticks many of the Elves’ boxes, being brightly coloured, big engined and also featuring a rather suave-looking Elf (they really don’t look that good in reality). You can see more of Calvin’s competition entry on Flickr at the link above. There are still several weeks to go in the competition, which closes on August 31st 2015. No-one has yet scored full marks, and we’re yet to see a Power Functions RC vehicle capable of Elf smushery entered – a remote control monster truck with racing stripes and an Elf at the wheel would stand a very good chance indeed. All entries will be judged by TLCB Staff at the end of the competition and the winner will receive two of the brilliant Lego books pictured above from the awesome guys over at No Starch Press, plus the runner-up will also get their hands a top Lego publication too. 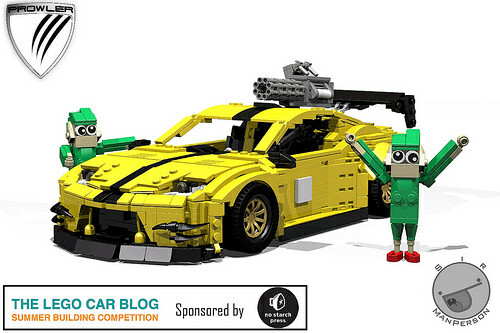 You can enter your creation for TLCB Summer Building competition in a number of ways, either here at TLCB, or via our partners on Flickr; LUGnuts and Headturnerz, where each has a discussion thread in which you can post your entry. Good luck! We usually only publish posts that feature genuine LEGO pieces here at TLCB (in fact it’s one of our submission criteria), however today’s creation warranted a closer look. Built by TLCB regular Sariel, this Technic dune buggy features a few parts that you won’t find with an official LEGO logo on. That’s because they’ve been created using the relatively new phenomenon of 3D printing, which enables a Computer Aided Design (CAD) to be realised for real via plastic moulding. Over the past few years the price of 3D printing has tumbled, meaning unique parts production is now within reach of many amateur designers and engineers (or morally-bankrupt individuals who think that the ability to print-your-own firearm is something the world needs…). Fellow previous TLCB bloggee Efferman has put his design skills to use and created a range of custom components that LEGO themselves have yet to officially produce. These include a 5 stud long steering arm (vs. LEGO’s 6 stud long version), a heavy-duty differential, and some wonderfully bouncy suspension springs, all of which Sariel has fitted to his excellent remote controlled dune buggy. The custom components appear to work beautifully with the standard LEGO Technic used in the rest of Sariel’s creation – especially the springs, which we’d love to test out ourselves (hint!) – and Efferman has designed a wide variety of other custom LEGO-compatible components that are available to purchase online. These include suspension and steering parts, pneumatic tanks, custom wheels, excavator buckets, plus a lot more that we’re not clever enough to understand. 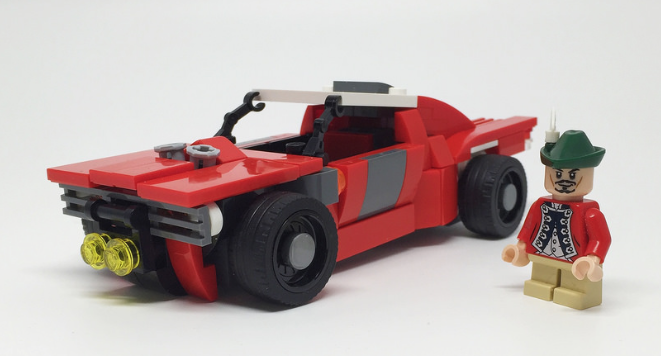 You can view Efferman’s extensive range of unofficial 3D printed Lego components by visiting the Shapeways Store, plus you can see more of Sariel’s dune buggy demonstrating some of these parts in action via MOCpages at the link above, or by watching the ace video below.